Tomatoes grow long, thriving vines in summertime and bloom repeatedly through the season to provide gardeners with a long and hearty harvest. These plants like full sun, lots of nutrition and consistent water, but come with some specific drawbacks, like pests and disease. A tomato plant's quick, thriving growth, juicy leaves and sweet fruit attract a number of different garden pests. These include tomato worms, leafminers, buster beetles, aphids, white flies, potato beetles, hornworms and stink bugs. 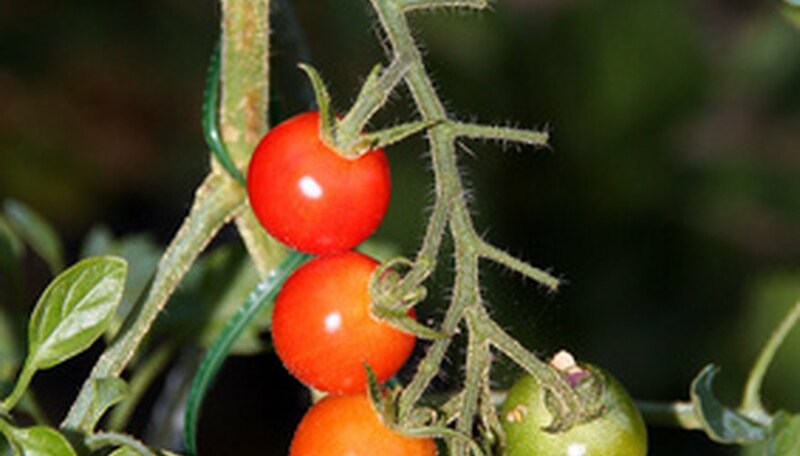 The insects devour tomato leaves, stems and blooms, and can cause overall weakening of the plant. Although garden shops offer a range of chemical and organic pesticides for these insects, many people prefer to prepare their own. Two tsp. of mild dish soap mixed into a spray bottle of lukewarm water is an effective repellent against most garden pests, and will kill some outright. The soap in the solution washes away the waxy coating of aphids, exposing them to predation and dehydration. It kills worms, which have no protective coating, and stuns beetles and bugs for handpicking. The solution will also repel future insects by coating the leaves and stems of the tomato plant. The best time to spray for tomato pests is in the morning, when bugs are still relatively sluggish and easy to spot. Coat the entire plant with the solution, and concentrate on the undersides of leaves or areas with heavy infestations. Hand-pick large worms and beetles off the plants after they're stunned, and allow the solution to work its magic on smaller insects. Many gardeners choose organic prevention methods for protecting their gardens from insect invasions. Borders of garlic, rosemary, chives, basil, borage and coriander all repel damaging insects or attract beneficial insects to the garden.